I have received confirmation on giant bones from editor! Borjomi skull and bones, normal size human bone in the middle! the giant bones of Georgia! The editor of World Geographic internet magazine has confirmed that they received a news story from Rustavi 2 broadcasting company about the giant bones of Borjomi, Caucasus mountains in Georgia! 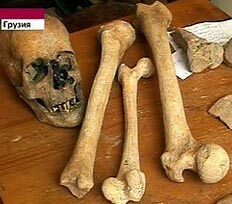 According to several articles on the internet there should in 2008 have been unearthed the bones of an ancient giant man near Borjomi, in Georgia - close to the Caucasus Mountains. This giant was estimated at 2.50 to 3 meters tall (about 9 to 10 feet) and is said to have a skull about three times the normal size. There are also pictures with most of the articles: The skull and bones - the large leg bones compared to a bone of a normal size human. The skeleton is reported to have been found in previously unknown cave at the "Haragulskom reserve" (must be the Kharagauli Forest Reserve) in the Borjomi gorge. There shall also have bound found a ruined city (settlement) and dilapidated crypts. The Borjomi skull seems elongated! The articles are also telling that human giants shall according to legends have inhabited the mountain region Borjomi and that geologists have shown that this area was once hit by a big earthquake that changed the surfaced of the landscape. One article is mentioning that Borjomi is not far from Mount Ararat, where Noah's ark according to the Bible landed after the Flood. In one article you can also read: "The finding of giants in the Caucasus mountains is nothing new. A Four-meter human skeleton was found by two amateur archaeologist in Georgia near the village of Udabno in the summer of the year 2000, and skeletons of giants were also found at a cave near Gora Kazbek, Georgia in the 1920's, not to mention the discoveries by Soviet scientists in the 1950's. On October 30, 1945 The Soviet News Agency TASS, and the Washington Post through United Press, reported: The Skeleton of a giant, with a skull 33 inches around and a shin-bone 33 inches long, has been found in the Tien Mountains of Russian central Asia north of the Himalayas." Bones of a 3 meter tall man were found by Georgian archeologists, reports Georgian Rustavi-2 TV station. The remains of the gigantic bones were found in an unknown before cave located in Kharagauli nature reserve near the town of Borjomi. The skull found, says the news channel, is three times larger than that of typical homo-sapiens. The discovery has turned out to be the real sensation, although it still needs to be studied carefully as scientists are just confused. It seems the finding is the confirmation of one of the unacceptable by science biblical scriptures which talks about giants who lived back in ancient times. For 100 years biologists and palaeozoologists have argued the possible existence of such giants. Such strange body structure of the sons of Anak, as the Holy Scripture calls them, absolutely contradicts the theory of evolution. Scientists also did not forget the fact that Borjomi is situated not far from the Ararat Mountain which is known for the remains of Noahs Arc found there. One article telling about the Borjomi giant was to be found on the World Geographic web pages. I contacted the editor and he could confirm that they had received the information from the block of news from Georgian TV Channel "Rustavi 2 ". I have tried many times to contact Rustavi 2, the largest privately owned television company in Georgia, but I never get any reply from them. I have also tried to contact archaeologists, museums and tourist operators in Georgia but it seems impossible to get proper information. I managed to get a reply from an archaeologist that had been in Georgia, Marc Meyer, but he denies than any such bones has been found. In my e-mail to him I mention that Dr. Lee Berger in South Africa has found giant bones but he claims that Lee Berger is referring to robust bones - not the bones of giant humans; That no such bones have ever been found anywhere. Well, I cannot see how Dr Berger could have talked about bones that not were human - because this is what he says about archaic Homo Sapiens: - They go through a period of giantism! Professor Lee Berger is obviously a brave man - giant human bones are not to be talked about! We got this information from the block of news from Georgian TV Channel "Rustavi 2 ". We have no contacts of scientists who work there. You can apply through the Institute of Archaeology in Georgia, Tbilisi. I have read on your internet pages that bones of large size have been found in the Borjomi, here http://world-geographic.com/lang/ukr/2010/08/u-hruziji-znajdeno-skelet-trymetrovoji-ljudyny-bones-of-a-giant-man-found-in-georgia/ Do you have any idea who I shall contact to learn more about this, like who wrote the story and who took the picture? Or even better: Names and e-mail addresses to the archaeologists! No such bones exist. Lee Berger is referring to robust bones - not the bones of giant humans. No such bones have ever been found anywhere. There is no evidence that such a race has ever existed. Photoshop is a great tool for falsifying images on the internet - but there are no such physical remains. If a single bone of a giant had ever been found it would be front page news and science would thoroughly examine and report on the findings. The fact that some obscure website is the only evidence for such a discovery should suggest to you that this is nonsense. Unless it's a massive conspiracy to suppress evidence, this is pure silliness. But there is no reason for a cover-up or conspiracy to hide this kind of evidence because this would be important, newsworthy, and the scientist who finds such evidence would become a household name - like Howard Carter who discovered the tomb of King Tut. I'm wondering; are you seeking confirmation for a biblical passage? Do you know this story? Did you come across anything like this during your research in Georgia (Professor Lee Berger has confirmed findings of large bones in South Africa, but the area at/around Caucasus mountains seems to be interesting as well)? I have tried to get in touch with Professor David O. Lordkipanidze but no success yet. No, I am not into the controversy creationists-evolutionists - just been following up a question Thor Heyerdahl asked me some years ago. I seem to be unable to get any reply from the TV-channel so I wonder if you know anything about these bones?